Even after 17 years, Expedite Expo 2017 was marked by several firsts in the show’s history including a new format, new role-specific workshops, and a new industry award–that were all well received by attendees and exhibitors. And while attendance by owner-operators and drivers grew from 2016, the fastest growing segment among this year’s attendees was fleet owners who own anywhere from two to over 30 trucks. “The show’s attendance reflects a trend that’s occurring within our industry as a whole–that is, the fast and furious growth of fleet owners,” says Lawrence McCord, chief executive officer of On Time Media (the producers of Expedite Expo). “For the past five years, fleet owners are the fastest growing group at our Expo. And this year, we had the most fleet owners register in all our history. The Expedite Expo is growing; the growth just looks different to what we’ve seen in the past.” To accommodate for the growth of fleet owners and other changes occurring in the industry, the Expo has adapted, which is reflected in some of these highlights from Expedite Expo 2017. At previous Expos, the educational sessions would begin at the same time the show floor opened. But the challenge was that many attendees would head straight to the exhibit hall and not realize that there were professional workshops available to help them get the most value out of their attendance. So, the Expo’s new format was created to offer attendees dedicated education and networking time for each morning–8 a.m. to 11 a.m. on July 14 and 8 a.m. to 10 a.m. on July 15–before the show floor opened. This way, attendees could focus their time on taking advantage of the full slate of educational workshops, without being distracted by other events happening at the show. Expedite Expo’s new education schedule was tailored to accommodate specific roles in expedited trucking–whether you’re a driver, owner-operator, or fleet owner. For drivers, there were workshops on topics, such as “The ABC’s of Expedite Driving” and “7 Guaranteed Ways to Make More Money in Expediting,” offering real-world tips, advice, and best practices on how to build a long-term, successful career in expedited trucking. For owner-operators, workshops included “Used vs. New Truck Purchase- -Which is Best for You?” and “Risks and Rewards of Hauling D.O.D (Department of Defense) Freight,” providing attendees with fresh ideas and proven strategies for how to increase revenue opportunities and make smarter equipment purchasing decisions. And fleet owners attended sessions led by other successful fleet owners to learn about topics–such as “Payroll and How It Affects Driver Retention” and “Employee vs. Independent Contractor Drivers for Fleet Owners”–that directly impact their business operations and bottom line. The second day of the Expo featured a panel discussion lead by Ellen Voie, president and chief executive officer of Women in Trucking, a national organization that encourages the employment of women in the trucking industry. Voie brought together a panel of three successful women expediters who shared their personal stories and insights on the unique challenges and opportunities for women in expedited trucking today. Imagine if you could have just about every resource you would need to help you succeed in expediting–all under one roof. That describes the Expo’s exhibit hall in a nutshell. Attendees got to see–and touch– the latest trucks and custom sleepers, with opportunities to get their questions answered by experts from Expediter Services, Stoops Specialty Trucks, Fyda Freightliner, Premier Truck Group of Knoxville, Buckeye Western Star, and Bolt Custom Trucks. The exhibit hall also enabled prospective owner-operators to meet directly with recruiters from a wide range of carriers– including Load One, FedEx Custom Critical, Panther, Landstar, Premium Transportation Logistics, V3 Transportation, Try Hours, among several others–to find the best fit for their business and lifestyle goals. And attendees who weren’t ready to buy their own truck but still wanted to learn more about the business were able to meet with fleet owners who were looking to hire good, dependable drivers to operate their trucks. But the Expo wasn’t all business; there were plenty of opportunities to kick back and have fun, as well. For example, on the first night of the Expo, there was Casino Night, sponsored by CIS, where over 350 owner-operators, fleet owners, drivers, motor carriers, and vendors tried their hand at Blackjack, Roulette, Craps and Texas Hold’Em–all on the house. This event offered a real casino experience, without the financial risk but with a whole lot of upside. And the upside was over $7,000 in prizes, donated by nearly 40 companies. Some of the grand prizes included a laptop computer (from The Transportation Station), large screen TV (from Premier Truck Group of Knoxville), dash cams (from Landstar Transportation), and $500 gift cards (from FedEx Custom Critical). 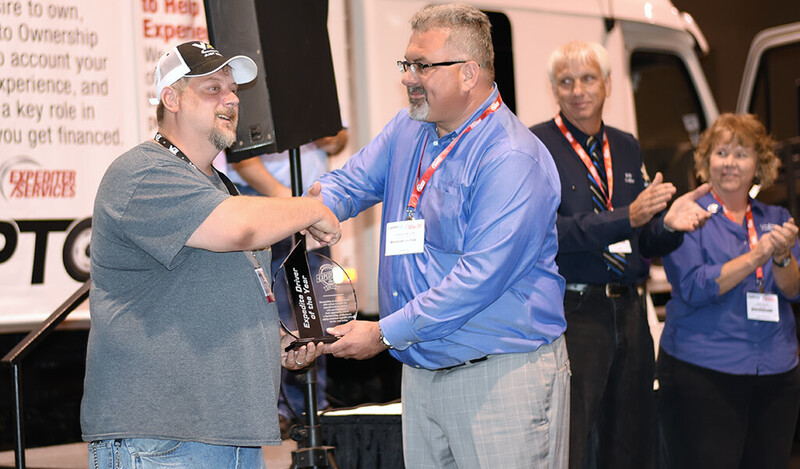 This year’s Expo also introduced a new industry award: the first-ever Expediter of the Year award, which was presented to Robert Burton, an owner-operator with his wife Christy, with V3 Transportation. Burton was selected among a strong field of finalists that included Bob and Linda Caffee with Landstar and Edward Estes with Bolt Express. The finalists and winner were chosen by three independent judges from Women in Trucking Association, CIS insurance and National Truckin’ Magazine. The Expediter of the Year award recognizes hardworking, professional and safety-conscious expediters who strive to make the expedite industry better and are deeply involved in serving and making a positive impact on their community. And that appears to be a fitting description for Burton when you consider his first act as Expediter of the Year: donating the accompanying $500 prize to St. Christopher Truckers Relief Fund, a charity that helps drivers whose medical problems have led to financial hardship. Save the Date for Expedite Expo 2018! So, when will Expo be next year? Mark your calendar for July 20 and 21, 2018, at the Lexington Center in Lexington, Ky. As always, registration and truck parking will be free; your only investment will be your time.